For your information due to filming and logistical reasons the Legends concert is now at 4.00 PM on Saturday 4th December. This will be followed by the Barclay James Harvest concert at 9.00 PM. The band apologises for any inconvenience it is a situation beyond their control. Tickets will be valid for BOTH concerts. There will be a break between bands and ticket holders will be allowed out of the venue. Anyone who has previously purchased tickets for Friday and can’t make the Saturday can get a full refund from Metropolis. The ticket price now includes TWO superb bands so they are likely to sell out very quickly. I have have just returned from the rehearsal with Mark Walker on Drums and Richard Coughlan on percussion. The set will take your breath away! This entry was posted in Gigs, News and tagged 2010, Legends concert on October 29, 2010 by caravan. fantastic news.I hope more people will be able to make the changed date as a Friday was proving to be difficult . Two superb bands on the same day 2 DVD’s two TV shows and two champagne receptions. How good is that!. I’m off to buy my ticket. 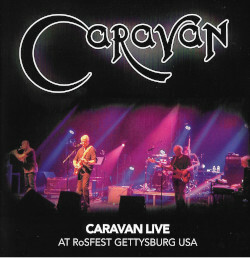 Lets hope that this Gig will lead to some more concerts from Caravan next year. OK I’m in £350 investment for two for a return of seeing two of my favourite bands. The Dragons would be impressed. GUTTED………… HAVE TO RETURN HOME AT 15:00 HOURS SATURDAY. so sorry that you can’t make it Steve . I will send you a complimentary copy of the DVD as soon as it’s released . Really sorry you can’t come … the change of date was of course a surprise to us too – we just do as we’re told! Husband and I have followed Caravan since their inception and have travelled to a lot of places to see them. Would have loved to have attended this gig but unfortunately Pension Credit does not allow for this expenditure. Simply do not have £350. Would only have wanted to see Caravan anyway. Never thought that would prove 2nd best to anything – Hey Ho! Been away for a while (no not inside!) so “Wow!” on the new site. I only hope the guys see a large slice of that. £350 is just silly with travel bevies and grub on top – much as I love the band. And like Lynn (6) I’d’ve only been interested in Caravan. Can’t make the gig but wish the band all the best. Look forward to the dvd and the gigs in 2011 ? Just in case you were wondering with the weather (which has been horrible up here in Scotland) both Pye & Jan heroically made it down from Scotland earlier in the week for band rehearsals. Unfortunately won’t be there myself but all the best guys for a great gig. God luck to all the band for Saturday hope its a resounding success. Hope we will get some pics posted on here. To all those who couldn’t come it was an absolutely brilliant show. Great privilege to meet the guys as well. Sorry to disturb – greetings from the John Lees’ Barclay James Harvest fan camp as it were. Anyway there are some fans of both bands who weren’t able to make it and would like to know what Caravan’s set list comprised. Unfortunately I’m not familiar enough with Caravan’s material to be able to do so. Is there anyone here who could let us know?